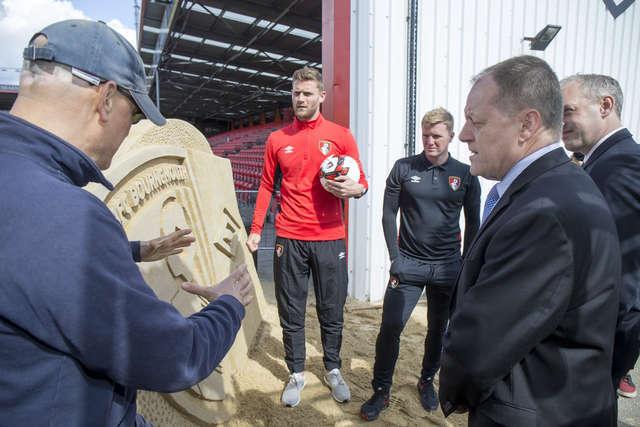 Simon Francis and Eddie Howe get more detail on the sand sculpture which marked the club's partnership with Umbro. 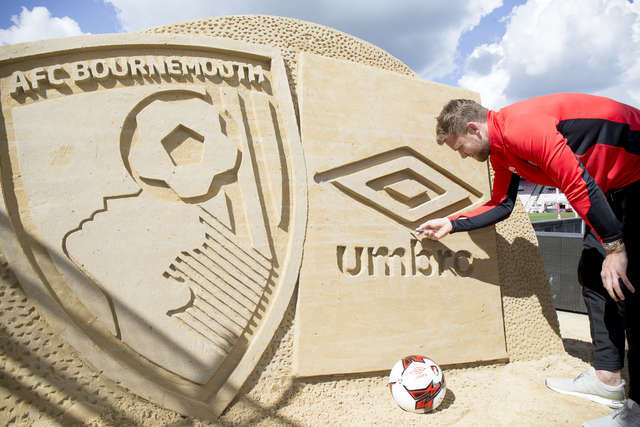 Simon Francis admires the detail on the Umbro sand sculpture. 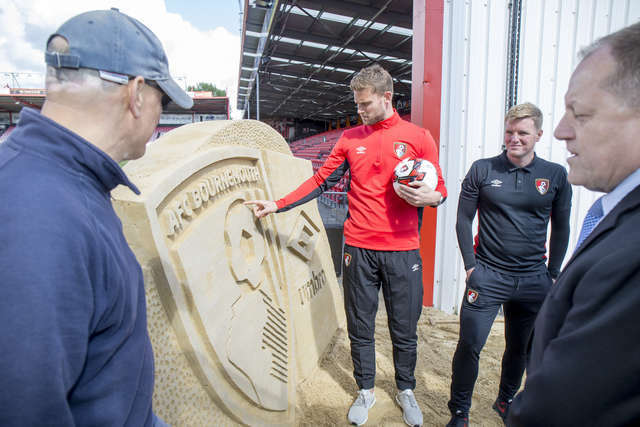 Simon Francis, Eddie Howe and Neill Blake chat to sand sculptor Mark Anderson and Umbro managing director Anthony Little. 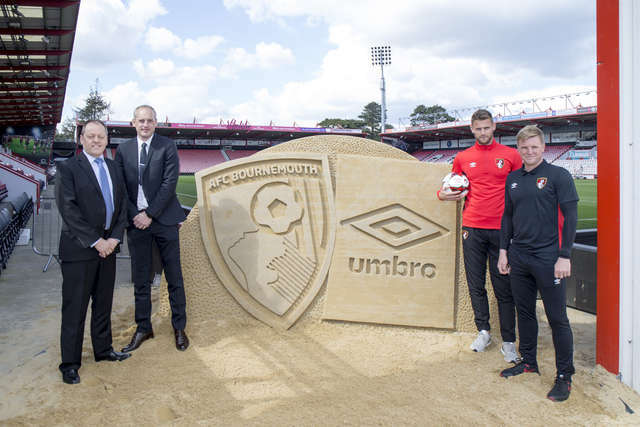 From L-R: Anthony Little of Umbro, Neill Blake, Simon Francis and Eddie Howe pose with the sculpture. Simon Francis fills in the final detail of the Umbro sand sculpture. Simon Francis poses with an Umbro ball to mark the partnership between them and the club. 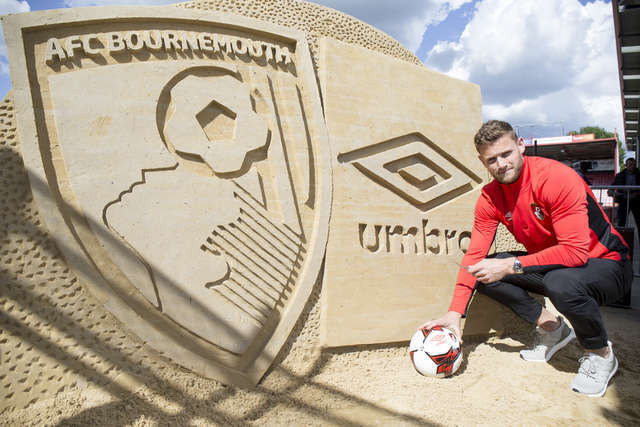 Speaking about the new partnership, Umbro managing director Anthony Little said: “We’re delighted that AFC Bournemouth will be wearing the famous double diamond from the start of next season. 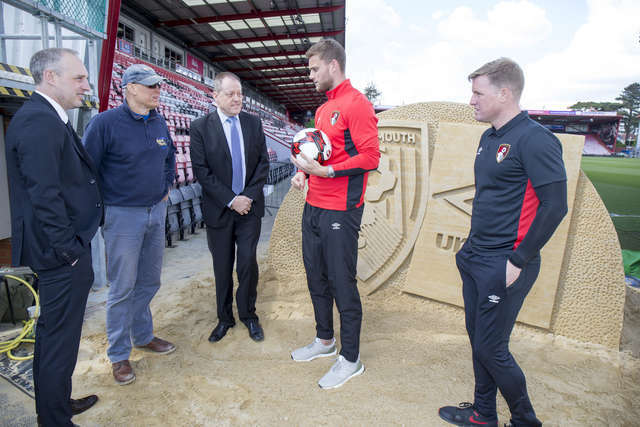 On Wednesday, Neill Blake was joined by AFC Bournemouth manager Eddie Howe, captain Simon Francis and Umbro’s head of UK soccer, Simon Johnson, at Vitality Stadium, where a giant sand sculpture of the two logos was unveiled to celebrate the announcement. The sculpture, which stands at two metres in height and three metres in width, was created over the course of two days by local sand artist Mark Anderson, using ten tonnes of sand. AFC Bournemouth’s partnership with Umbro begins at the start of the 2017/18 season, with the club’s new kits being unveiled this summer. 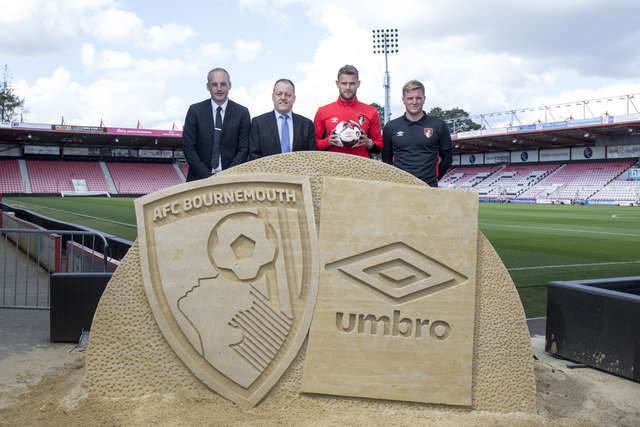 AFC Bournemouth is a forward-thinking, progressive club and our new partnership with Umbro is the perfect example of that.